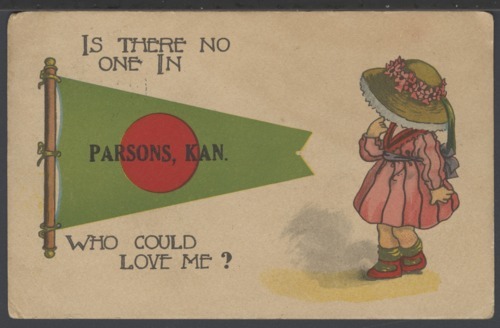 This novelty postcard shows a young girl and she asks "Is there no one in Parsons, Kansas who could love me?" The recipient of this postcard was Mr. Clifford Fullen in Bartlesville, Oklahoma. Is there no one in Parsons, Kansas who could love me? Creator: T. P. & Co. N. Y.